In the final volume of The Complete Terry and The Pirates, reprinting every strip from the years 1945 and 1946, World War II comes to an end, and then Milton Caniff says goodbye to his greatest creation. Readers will be sometimes delighted, sometimes shocked by their last visits with the Dragon Lady, Pat Ryan, Burma, Hu Shee, Snake Tumblin, Papa Pyzon, Tony Sandhurst, Baro In the final volume of The Complete Terry and The Pirates, reprinting every strip from the years 1945 and 1946, World War II comes to an end, and then Milton Caniff says goodbye to his greatest creation. Readers will be sometimes delighted, sometimes shocked by their last visits with the Dragon Lady, Pat Ryan, Burma, Hu Shee, Snake Tumblin, Papa Pyzon, Tony Sandhurst, Baron de Plexus, Nastalthia Smythe-Heatherstone, Jane Allen, Deeth Crispin, and April Kane. 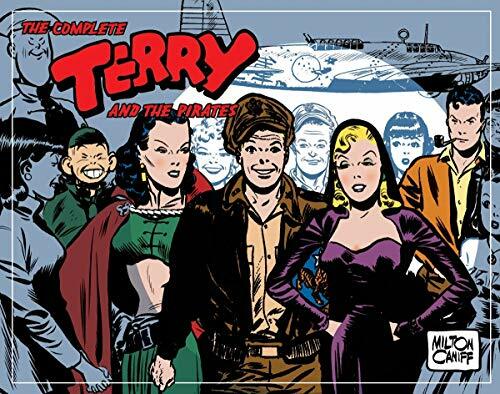 In the final volume of The Complete Terry and The Pirates, reprinting every strip from the years 1945 and 1946, World War II comes to an end, and then Milton Caniff says goodbye to his greatest creation. Readers will be sometimes delighted, sometimes shocked by their last visits with the Dragon Lady, Pat Ryan, Burma, Hu Shee, Snake Tumblin, Papa Pyzon, Tony Sandhurst, Baron de Plexus, Nastalthia Smythe-Heatherstone, Jane Allen, Deeth Crispin, and April Kane. Born in Hillsboro, Ohio in 1907, Milton Caniff is one of the most honored cartoonists in history, with awards ranging from two Cartoonist of the Year "Reuben" awards from his peers in the National Cartoonists Society, to the Exceptional Service Award of the United States Air Force.